Attending a promotional event for his upcoming comedy film I Love You, You’re Perfect, Now Change! <你咪理，我愛你!>, Wong Cho Lam (王祖藍) reveals that he will be going on vacation on Valentine’s Day in celebration for his wedding anniversary with Leanne Li (李亞男). According to Cho Lam, Leanne is planning to make her first public appearance since giving birth on the day of the film premiere. Although the actor revealed that Leanne has already watched this movie many times in the comforts of her own room, she still wants to experience it in theaters. I Love You, You’re Perfect, Now Change! 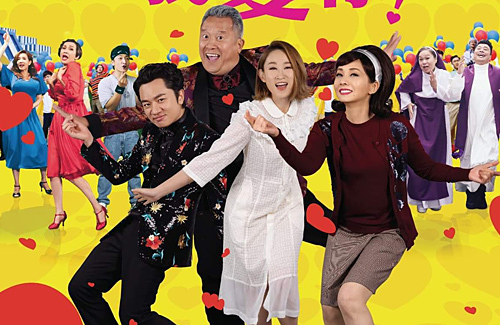 features an impressive ensemble cast consisting of Eric Tsang (曾志偉), Teresa Mo (毛舜筠), Wong Cho Lam, Ivana Wong (王菀之), Sammi Cheng (鄭秀文), and more Hong Kong stars.